The Bloom family, pictured during one of their shows, will be the featured act for the magic show this coming Saturday. 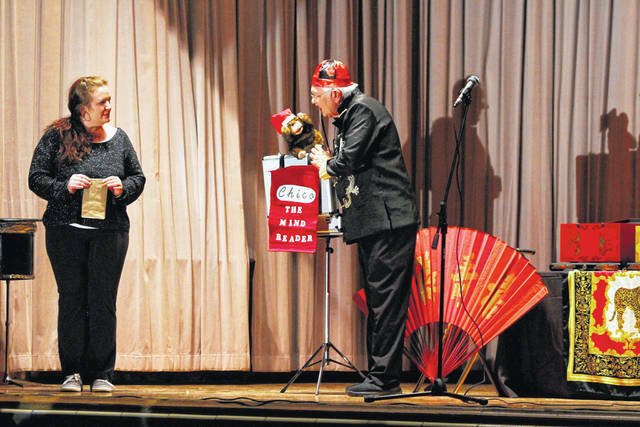 POINT PLEASANT — Anyone needing a little bit of magic in their lives as well as a fun night out with the family will be able to get their fill by attending a magic show this weekend. The Mason County 4-H Leaders Association will be hosting a magic show provided by the International Brotherhood of Magicians the Tommy Windsor Ring #197 of Marietta, Ohio. The show will be take place on Saturday, March 30, 7 p.m. at Point Pleasant Junior/Senior High School (PPJ/SHS). Tickets can be purchased in advance at the Mason County WVU Extension Office for $5 a piece or they can be purchased at the door for $8 a piece. Lorrie Wright, WVU extension agent, shared some local schools have booklets of tickets to sell as well. Wright shared she was approached by Mason County native Dale Wheeler who is the president of International Brotherhood of Magicians the Tommy Windsor Ring 197 as he and fellow members of Ring #197 wanted to donate their time to help with the funding for the restoration of the 4-H dining hall. The Mason County 4-H Leaders have raised over $125,000 since this dining hall project began in 2015 with the dining hall being torn down and construction on the new dining hall beginning in June of 2016. The funds raised from this magic show will be helping finish the repairs as they are nearly complete. According to the International Brotherhood of Magicians the Tommy Windsor Ring 197 website, the International Brotherhood of Magicians is a worldwide organization of amateur, semi-professional, and professional magicians. The Tommy Windsor Ring 197 of Marietta is a local chapter of that organization. The purpose of the national organization and Ring #197 specifically, is to further interest in the art of magic by putting together magicians of all backgrounds and skill levels. Some members are working professionals while others are only interested in learning magic for their own enjoyment or to entertain their own family members. Wheeler shared his interest in magic began when he was just 10 years old. The first show he attended featured his future high school principal Benjamin Franklin IV. Following one performance, Franklin called Wheeler into his office and offered him words of wisdom as well as tips to better his magic presentations. Wheeler continues to be a lover of magic and gets to return to the stage of his alma mater this Saturday. According to the his performer profile, his style of magic is best suited for a situation where he is mingling about, also known as “strolling magic,” and using “everyday” props. With a deck of cards, a few rubber bands, and some spare change, Wheeler has been known to entertain for hours at a time, creating unique and individual experiences for all in attendance. Since his mastering of “close-up magic,” he has been asked to entertain audiences at several International Motorola Conventions as well as corporate dinners in the Charleston area, to trade shows around the tri-state, and even performing walk-around magic at the world famous Aria Resort and Bellagio Hotel & Casino in Las Vegas, Nev. Along with Wheeler, the show will also have magical acts performed by Chester Gault, Joe Berman, Kenneth Brown, Tim Angeloni, Dana Holleran, and the Bloom family. Wheeler shared the Bloom family will be the featured act of the evening. According to the family’s performer profile, the Blooms are an international touring, family oriented magic and illusion show. The Blooms have headlined in Las Vegas and have appeared with numerous celebrities. For nearly twenty-five years Grand Stage Illusionist and Master Magician John Steven Bloom has been charming audiences with his special blend of magic, humor, and family entertainment. The Bloom’s show is considered flexible and crosses demographics. John has appeared with rock legends Alice Cooper, Neal Schon and Kevin Cronin, comedian ‘Weird Al’ Yankovic and country stars and actors such as Pam Tillis and Billy Bob Thornton, to name a few. John has been seen on international stages, headlined at the Texas Station Casino in Las Vegas, and has been featured on statewide televised programs. However, the performances that are considered the most enjoyable are the opportunities for his full length, fully staged productions in local and regional performance venues which include his entire family. Some information from https://mariettamagicclub.weebly.com was used in this article. 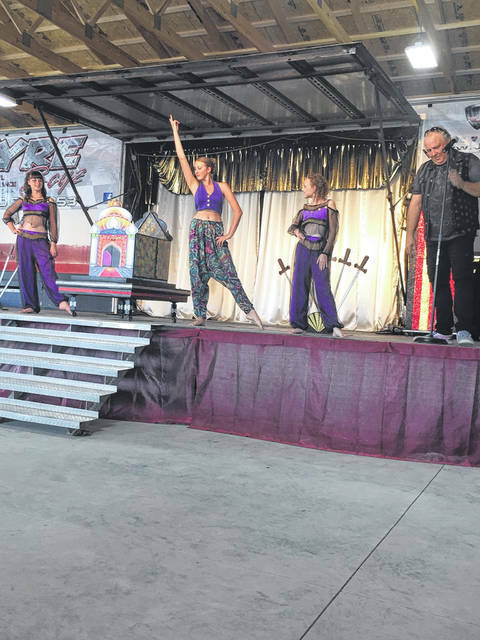 https://www.mydailyregister.com/wp-content/uploads/sites/24/2019/03/web1_Magic2-2-.jpgThe Bloom family, pictured during one of their shows, will be the featured act for the magic show this coming Saturday.